Whyte T-130C is still a really capable trail bike and can be ridden harder than the original, but has fun-loving personality has been traded for raw speed? The B'Twin Rockrider AM 100S is available with three different wheel sizes. From smallest to largest, the same bike takes 27.5in, 27.5 Plus and 29in wheels. Yes, the Polygon Siskiu D5 frame is top-notch but the parts spec is lacking. If it was £750 it'd be a steal but it's outclassed by other £1k full sussers. The 2018 Norco Sight A2 is the perfect prescription for big-wheeled trail fun. It's a versatile aluminium trail bike with sorted components. Could the key to eternal youth lie in the a Californian dream with wide wheels and voluminous tyres? Here's our Intense ACV Pro review. 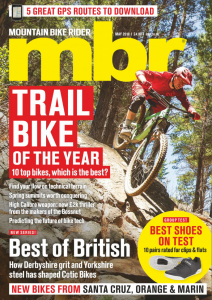 We crowned the Commencal Meta TR our 2017 27.5in Trail Bike of the Year. A lot has changed in a year so has Commencal done enough to retain its crown?